Toukiden 2 offers a rich online environment in which Slayers can team up to take on the ferocious demons known as Oni. Slayers will find mysterious Portal Stones scattered throughout the Otherworld, which, when touched, will transport them to the multiplayer lobby. Accepting missions at the Command Hub will allow up to four players to take on Oni throughout the Ages, granting them the upper-hand in battle with well-coordinated teamwork. Multiplayer features can be enjoyed on both PlayStation®4 and PlayStation®Vita system versions, with local ad-hoc network multiplayer available for PlayStation Vita users. 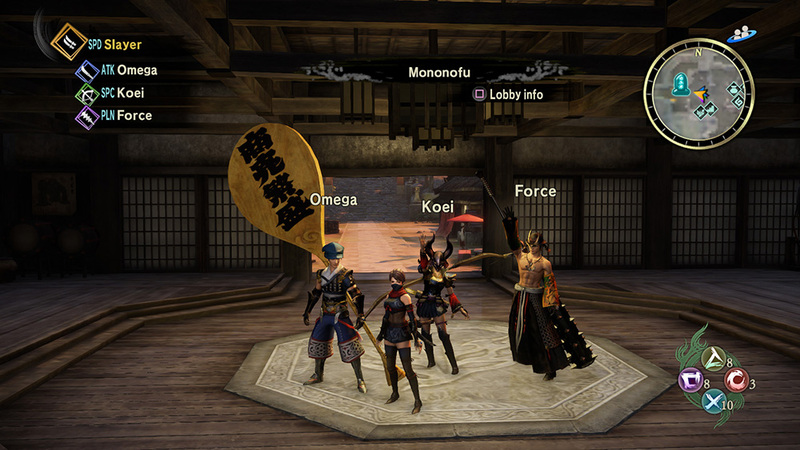 Each Slayer can make themselves unique by utilizing the game’s vast character creation system, which boasts a wide variety of different visual styles never previously available in the Toukiden series. Online multiplayer mode aside, the campaign experience has also been heavily enhanced forToukiden 2. Apart from the main storyline missions delivered from the Holy Mount, players can explore an immense open world and encounter other Slayers for cooperative Joint Operations. By aiding those in need a variety of rewards become available in the form of weaponry, armor and new Mitama, as well the opportunity to form a party! Those playing offline can carry out Joint Operations by meeting Doppelgangers, the Ghost Data of their friends, which offer the same functionality as human companions. While carrying out these operations in the Otherworld, Slayers may find it useful to exchange equipment to even the odds against tough opponents. Accessing the Reliquaries – containers for sacred relics – across the world will allow them to place items inside for retrieval by other Slayers. Donating items into a Reliquary not only aids fellow players, but returns an item of equal value! This new feature to the hunting-action genre allows Slayers to unite and aid each other in a way which was never previously possible. The new additions in Toukiden 2 don’t stop there! The game’s boundless battlefield hosts a plethora of new Oni inspired by western lore. The Drakwing, a beast resembling a legendary dragon, the Canidaemon, a wolf-like creature which harnesses the power of wind and lighting in its tail, the Wingspawn, an Oni which breaths deadly poison which turns humans into demons and the Bruteclaw, a heavily armored six-legged demon are only a few of the new enemies that plague the Ages. Finally, pre-order bonuses are available from select retailers before launch, including the Tenko Costume armor, which allows Slayers to dress up as their fluffy partners, and the Sanada Masayuki, Sanada Nobuyuki, Sarutobi Sasuke and Chiku Rin In Mitama help bolster player’s skills and abilities, aiding them on their Oni-slaying adventures! For more information about the game, you can check out the screenshots and the new trailer down below, or you can check out the official website for Toukiden 2 over here. Toukiden 2 is set to release for the PlayStation 4, Vita, and Steam on March 21, 2017.